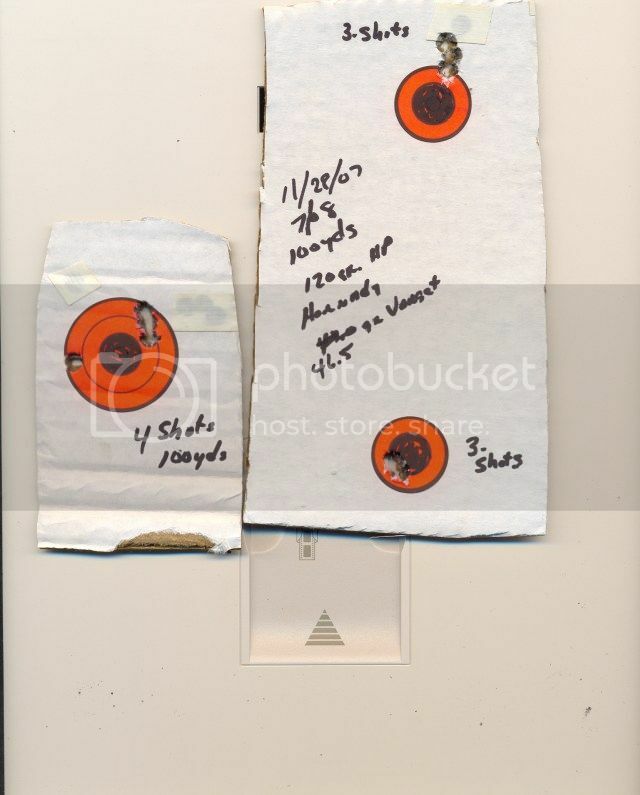 I shoot an encore in7mm08.The barrel is a bullberry.I am trying to work up loads for it but the last primers I got were cci large rifle magnum.I am shooting blc2 and trying the 4007ssc powders.I dropped my starting loads down and and varying my loads by .4 grains. The bullet is just a about .005 off of the lands with hornady 139 btsp. but I am getting 1 to 2 inch groupds with almost all loads.,My question is ,If I back down to large rifle primers could I see more consistacy( I dont have any lr primers,Will have to find some)and the second question what powder seems to shoot best in your rifles. Shilen barrel 23 1/2 in long. Liberals and labotomies go hand in hand. The first thing I’d do is change to a standard primer. It’s important to match your primer to the amount of powder you intend to burn. Too much heat can have adverse results, you wouldn’t consider using a pistol primer would you ? The same principals apply. I’ve had the best luck with Winchester WLR and Federal 210M (M is match 215 is magnum) in my 7MM-08. I shoot Varget in my gun. It’s probably one of the most popular powders for the 08. Do some runs over a chronograph and you’ll see why !!! BLC2 has always been a quirky powder for me. I know that many love it for the smaller cartridges (.222, .223 and etc.) but I have never had much luck with consistent accuracy. Since it is a relatively fast burning powder I would do as 221 suggests and switch to standard (or even match) primers and avoid the magnum primers with this powder. There really isn't much need for magnum primers unless you are loading some of the large capacity or over-bore cases with a much slower powder selection. If you have the new Hornady reloading manual you will find the best recommended powders for the Encore/Contender loadings. For the 139 gr Hornady the top powder is IMR-4064 start 33.6 max 42.3, next Vit N-140 start 33.4 Max 40.8, RL-15 start 34.3 max 41.0, Varget start 33.5 Max 41.5, then the lower velocity powders are IMR-4350 start 39.6 max 45.0, and AA-4350 start41.5 max 45.6. These loads were tested in a TC Encore with 15" barrel 1 in 9 twist. Hornady/Frontier cases, Remington 9 1/2 primers, Max COL 2.800"
My experience with BL-c2 powder is that it burns very dirty with early fouling effects on accuracy. The use of magnum primers where not recommended in the reloading manuals are not necessary and do not usually produce good accuracy. I stopped at Simmons sporting goods in birmingham this afternoon and bought a lbs of varget,A brick of winchester large rifle primers and a box of 139 hornadys. I ll let ya know something sunday. The first time I tried the 7/08 for deer I worked up a load with the 139 sst's and IMR 4064,don't remember the exact amout of powder but think it was a max load. Dropped a buck in its tracks.I am thinking it was over 200 yds. 2 years ago I decided to try the 7/08 with a hornady 120 SP,dropped a 110 lb doe at 200 yds. Year before last I decided to try the hornadyHP 120 gr.Shot a 80 lb doe at 140 yds and a 165lb 10 pointer at 100 yds,both dropped where they stood.I used varget for both the 120 gr loads. If you are not set on the 139 hornadys you may want to try the 120 gr either the SP or the HP. I usually find the best accuracy with the lightest primer that will light the powder reliably case in point I usually use small pistols in .218 bee for itty bitty bugholes way out there. large rifles would be the smallest I'd go for your 7-08 though. especially if you're gonna use up that blc-2. I remember reading something about magnum primers having enough breciance? to launch the bullet and powder un burned into the barrel before ignition was complete in small volume cartridges. this doesn't sound accuracy enhancing to me. As the more efficient shapes contain the burn more effectively than the long skinny ones do. Don't assume that regular primers will give better accuracy than magnum primers because that isn't always true. Further more, in testing primers such as Federal 210M, Federal 215M, CCI 250, WLR, Remington Large Rifle Magnum primers, and WLRM primers in cartridges the size of 308 Winchester and larger, I have not had to vary powder charges except with Remington primers. Remington primers seem to be a bit cooler and will probably need an increased powder charge. As far as accuracy is concerned, I've gotten the best accuracy with CCI 250 large rifle magnum primers in both a 308 Winchester handgun and in a 357 Herrett handgun. It's also not just me. In the Handloader magazine that came out around 12/08, there was an article testing 308 Winchester accuracy with a large variety of primers, bullets and brass. Guess which primers gave the best accuracy compared to ALL of the major brands; even the bench rest ones? CCI 250 primers. Owensby, excellent shooting by the way. Thanks for shareing the article on the cci 250 primers,will have to give that a try.Have never thought of useing a mag primer in the 308. Last year I was getting ready to shoot a 300 yd egg shoot and had run out of win primers for my 223,so loaded up my favorite load with fed.At 300 yds my groups opened up to over 2 inches.Got more of the win primers and groups went back down to less than an inch. Been shooting and reloading for over 50 yrs now and now I try to keep a supply of all primers. Got a browning 270 wsm years ago and wanted to shoot the barnes tsx bullets,this rifle would shoot several reg bullets but couldn't get the tsx's to shoot as good as I wanted.Sent barnes a e-mail and they sent me loads for their bullets,they weren't useing mag primers untill they got up to 140 gr bullets. Anyhow tried LR primers and the tsx started shooting tiny groups with the 130 gr tsx. I built a Savage 110 action 7mm/08 using a 22" factory barrel set to tight headspace. I have the stock glass bedded and the barrel floated. Scope is a Mueller 4.5X14 APV. My best load to date is 42.5 grains of Varget in RP brass and BR-2 primers pushing a Nosler 120 grain BT seated .012" off the lands. Velocity is 2957 fps and 5 shot groups are around .632".